PUNE: Daan Utsav (DU) is the ‘festival of giving’, which is celebrated every year in India at a national level, commencing on Gandhi Jayanti – from October 2nd to October 8th launched in 2009, the festival aims to inspire all Indians across every state, city, region, class, community, religion and age to contribute to the society in any manner they choose to and celebrate the act of giving. Currently there are more than 6 Million people across India celebrating the festival and evangelising giving. There are several DU events happening in Pune this year, some of the major events total of eight major events planned for Pune this year – Seva Mela on 1st and 2nd October at Phoenix Market city, is an event to connect citizens of Pune to NGOs, encouraging the act of giving. Seva Sandwich, is an event where volunteers come together at different locations, make sandwiches and distribute them to the underprivileged in the vicinity. Happy Spots help brighten communities and beautify neighborhoods by cleaning and painting classrooms, bus stops etc. Design4Impact is a volunteer management workshop which will focus on "Designing Effective Volunteering Programs” for the interested volunteer leaders / NGOs ensuring more organized volunteering programs achieving maximum impact for India’s social development. “We have Fundraiser musical evenings with Woodwinds and Jonky. Speaking Walls-is an effort to express gratitude to the police, citizens, children and police together will be painting some part of the police chowkis and also children from slums will interact with police. Priceless Sale, a unique event where citizens pickup interesting merchandise and pay any amount of their choice. The inventory is donated by socially conscious brands and artisans. The funds raised shall be utilized to run leadership development programs for children in underserved schools. Collection Drives will be organized through the week by Being Volunteers, encouraging different societies to donate clothes, stationery, food for orphanages, NGOs,” said a volunteer. Rajiv Malla, Director Phoenix Market city Pune said, “Success brings with it responsibility. As a socially responsible corporate, the concept of giving back to the society is of utmost importance for business sustainability. We have been holding our own ‘Joy of giving’ events since inception and are delighted to associate with our country’s very own “festival of giving”. Over the years people from all walks of life, from CEOs to auto drivers, school children to celebrities, homemakers to opinion leaders, millions of people have given their time, money, resources or skills back to the society - by creating or participating in ‘events’ of their choice. Daan Utsav also gets support from well-known celebrities like Amitabh Bachchan, Sachin Tendulkar, Harsha Bhogale etc. 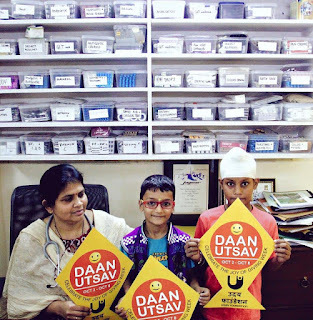 Daan Utsav brings the seva-bhav which laid the foundation of my upbringing; it is very close to my heart as I continue to be associated with it ever since inception,” concludes Neha Shrivastava, member of iVolunteer and volunteer at Daan Utsav.